10/15: Living room with sofa sleeper and a view of beach. Summer Breeze is located in Miramar Beach only steps away from the incredible Destin beach and a bike/walking trail that goes for miles. Come and enjoy beautiful, breathtaking views of the emerald waters, sugar white sand beach, or enjoy tranquil sea breeze while watching palm trees swaying and the amazing sunset from your private balcony. Your balcony also overlooks the pool and hot tub area. Summer Breeze has a heated swimming pool with lounge chairs, umbrellas, and a hot tub. Outdoor wash for a sand free retreat. There are charcoal grills and picnic tables in the common area for your use. 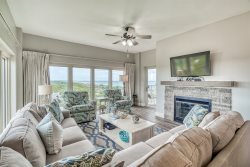 It is conveniently located near several great restaurants, grocery stores, Destin Commons, Silver Sands Outlet Mall, theaters, and award winning golf courses. This unit has a master bedroom with a queen size bed, built in twin bunks in the hallway and has a queen sleeper sofa in the living room. The updated kitchen will is fully stocked for the times when you feel like staying in and cooking! Add $85 for housekeeping and 11% for tax. $69 damage protection; 2.5% to process credit card payments. 25% of the total is due at booking and will hold the unit for you. The remaining balance is due 30 days prior to your arrival.